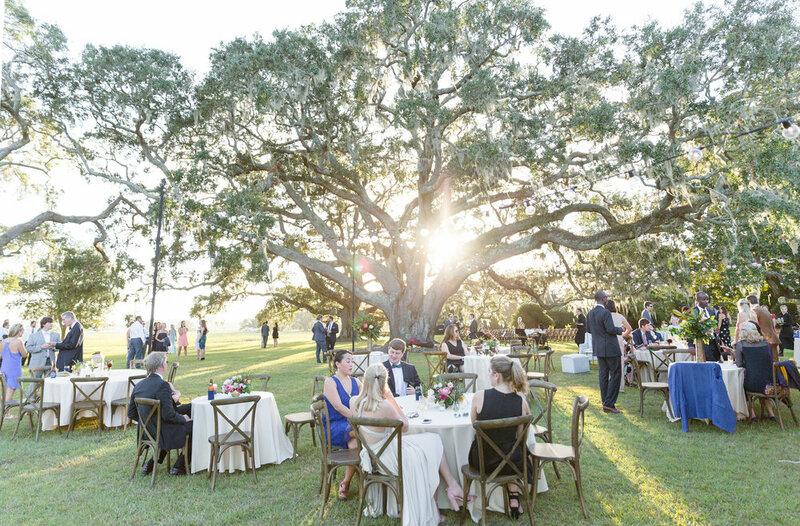 New Orleans couple Carrie Faust and Douglas Rushton wanted to incorporate the romantic natural elements of the Lowcountry into their South Carolina wedding and couldn't resist the allure of Cypress Trees Plantation on Edisto Island. With the help of Kate Thornton of Captured by Kate Photography, the couple detailed the entirety of their secluded destination wedding. In her 15 years as a professional photographer, Kate has honed her ability to create stunning photos no matter the client's particular needs. Still, it's nice for a photographer to be given creative control to capture those precious moments exactly as he or she wants. That's what Kate and her newest clients from New Orleans decided early on in their working relationship. Kate says, "One of the first things Carrie told me is “I trust you, and I want you to have total creative freedom. We want artistic and candid photos, and we will be sad if we end up with typical, posed wedding photos.” Right away I knew Carrie was a dream client!" Carrie and Douglas chose Cypress Trees Plantation for both their ceremony and reception. The property dates to the late 1700s while the current home was built around 1830. A true family owned farm, Cypress Trees Plantation has been in the same two families since its inception, and the current owners are the fourth generation in their family to oversee its history. While it is a working farm (the current owners lease it out to be utilized for soybean, tomatoes, and cucumbers), Cypress Trees Plantation retains much of its historic charm. Couples like Carrie and Douglas are drawn to the property's rich past, manicured lawns, and stunning marsh views. After all, who could resist an outdoor ceremony by the water underneath centuries old oak trees? Plus, the outdoor location meant that their beloved fur baby would be present for the fun as well. 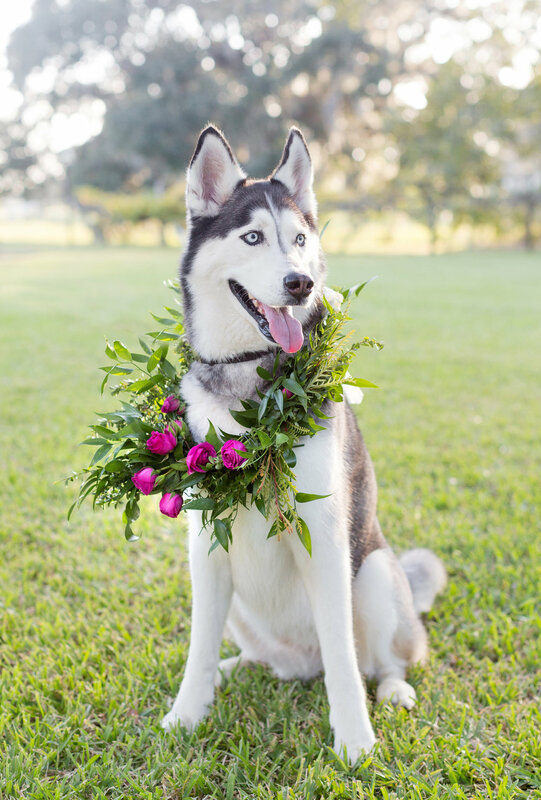 "Having their dog in the wedding day festivities which made for some great candid moments!" says Kate. While Carrie and Douglas loved the beauty of Edisto Island, they wanted to include some personal touches all the way from the Big Easy in their big day. 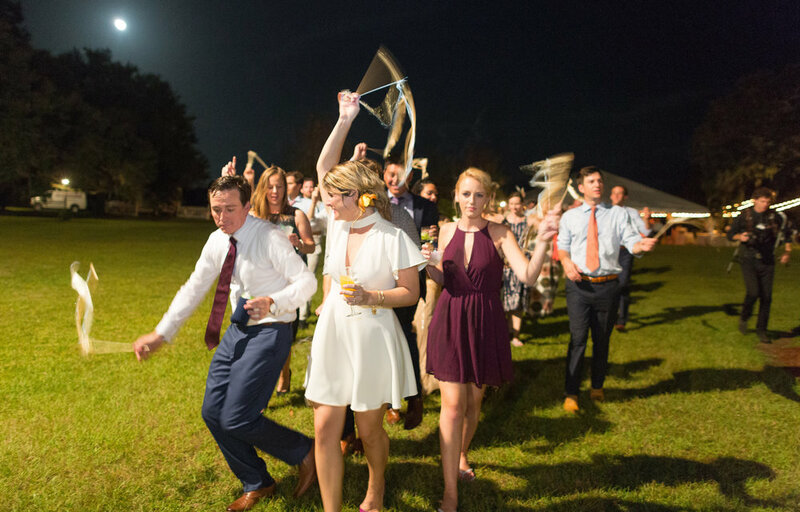 Kate remembers, "The couple ended the reception with a Second Line Dance where the horn player in the band led a parade of streamer waving guests around the dance floor and through the exit to end the celebration."